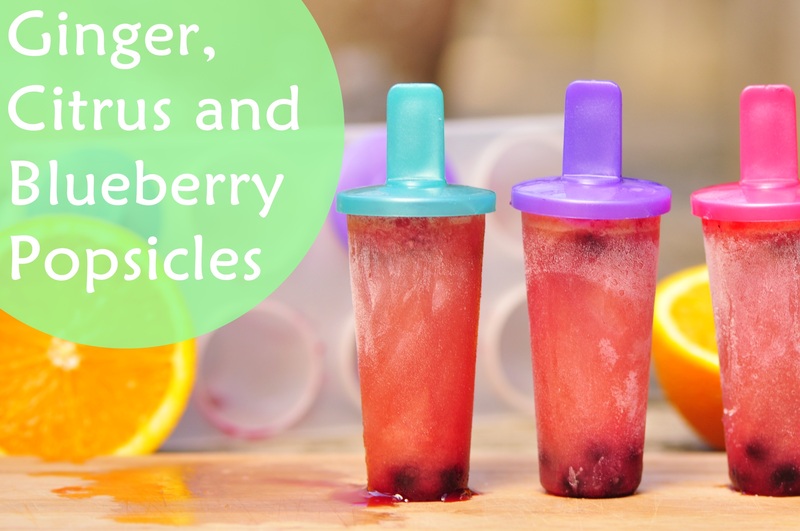 Homemade popsicles are fun, easy and better than store-bought ones for so many reasons. The generic popsicles you get from the grocery store are alright, but they’re filled with sugar and food colouring and probably not much of anything else. If you go to buy healthier ones, they’ll be double the price. Catch-22. That’s why I decided to make them at home. You don’t necessarily have to own a popsicle mold for this recipe. You can pour the liquid into small dixie cups and place wooden popsicle sticks inside, or you could use mini-muffin tins as well. Most dollar/grocery stores carry popsicle molds for cheap though, and the hold the stick upright which is handy. Using cold water is important for colour. I figure if you’re using frozen blueberries, they leak colour very quickly and they don’t need to be squished. Keep the blueberries in the freezer until the last minute, and keep the water cold so less can leak from the berries. 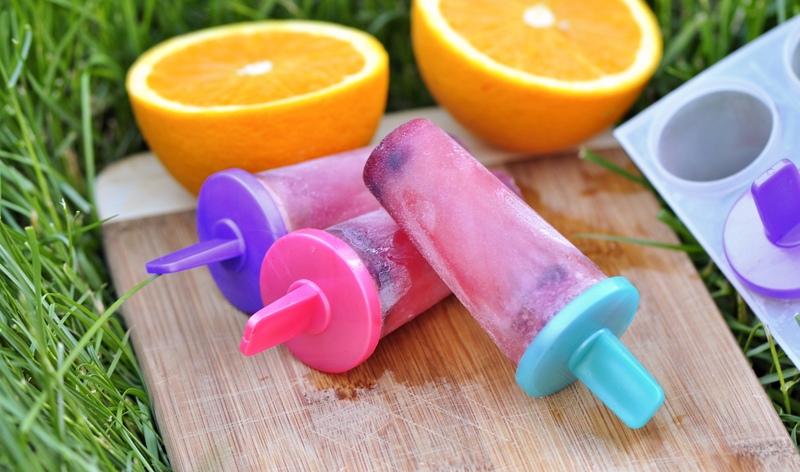 This way your popsicles will have a mix of purple and orange. Place ginger, lemon and orange juice in a blender and process until frothy and well mixed. Add in cold water and honey, and blend on high-speed for 20 seconds. 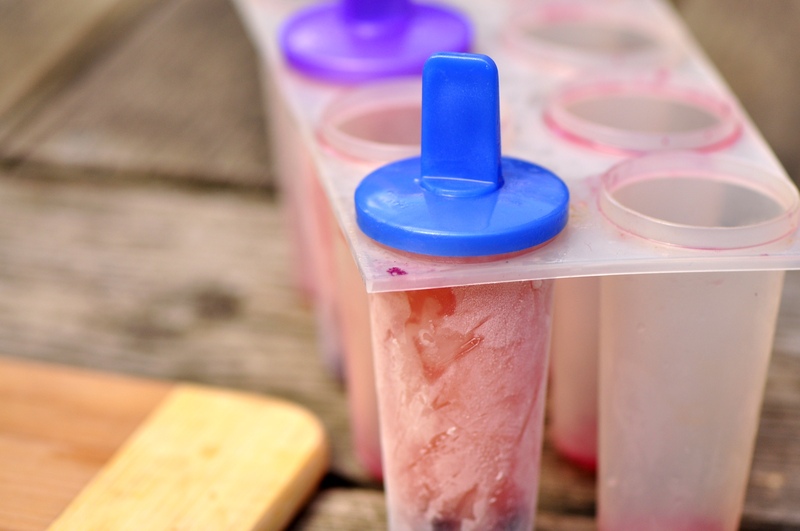 Pour the mixture into a popsicle mold, filling each one just below the top so it does not over-expand when freezing. Drop frozen blueberries evenly into each popsicle mold so that each one has the same amount, then place tops of molds on the mixture. Freeze popsicles for roughly 3 hours until they are completely solid all the way through. Enjoy! They look cool – in more ways than one. Wonderful colours. the office is pretty warm. I want one. Where did you get the ice pop molds you use?